South Africa has the 10th largest road network in the world and truck drivers are transporting large quantities of cargo along long distances on these roads. How do they manage to do this while remaining alert behind the steering wheel? How are transport operators assisting them to share the roads safely with other vulnerable road users? We approached experts in logistics from Barloworld Transport to gain insights to the challenges and the pro-active steps taken to prevent fatigue related road crashes. Regulation with regards to driving hours of truck drivers are covered not by the Rules of the Road but by the Collective Bargaining Council. What are the basics of the Agreement with the Collective Bargaining Council? In terms of the Main Agreement and overall limitation of hours of work, an employer may not require or permit an employee to work more than 90 hours in any week, inclusive of ordinary hours of work, overtime hours and hours worked on a Sunday or public holiday. Is this based on driving hours only or also in distances travelled? This is based on ordinary hours of work and overall limitation of hours of work. In the absence of formal legislation, does self-regulation in the trucking industry become more important? Yes, definitely. Even with legislation from BCEA and NBCRFI it is important for us to self- regulate to ensure safety or our drivers and staff. Yes. Every contract is different and the management around drivers and trips is managed at a fleet/contract level. We run a vast operation from 24 hour operations, long distance brokered loads, refrigerated loads, dedicated contracts Monday to Friday, etc. This means that each contract and each driver’s hours and work conditions needs to be monitored daily to ensure safe driving parameters in terms of the specific work requirements. Are there specific routes / roads where driver fatigue in South Africa among truck drivers is a bigger risk? Yes - definitely. The Cape Town route from JHB is always high risk due to the long straight roads and fatigue can play a major role there. With the more mundane, straight roads, the driver does not have to actively drive for long periods of time but is cruising at 80 km/h in their highest gear. This then allows the driver to go into a state of non-active driving and these periods result in a greater likelihood of falling asleep. Does crime and the risk of truck-jacking add further pressure on truck drivers to where they may be able to make a safe spot? Yes, it does. But this can be countered by good Road Route Assessments and safe stopping areas planned for each of the fleets / companies routes. We believe it is best to not leave this to the discretion of the driver but to have planned and approved stops along each route to enable to the driver to be able to plan his route to these stops. Do we have enough quality truck stops in South Africa to accommodate truck drivers and provide safe and comfortable stop - overs? What would be your requirements for a safe truck stop? PDLP in house covers fatigue, signs of, medication, what to do, how etc. Professional Driver Learnership Programme. Ongoing training programme, starting with a 2-week induction course and then refresher every year. Violations of daily drive times are reported on our in-house SHEQ system Isometrix - violation are logged, investigated, actions allocated and then closed out. From this we can see trends and pick up high risk contracts etc. Mobile Eye: we are currently testing 8 Mobile Eye advance warning systems in our vehicles. These react in the truck by a buzzer and record the instances when a driver moves over a line without indicating and/or gets too close to the vehicle in front of them. The aim being to actively alert the driver in the cab if he has gotten drowsy and has not reacted in time and then the record of these instances can be used to speak to the driver about post trip and to trend improvement in performance. To date the stats how a marked decrease in this type of behaviour over time when the drivers have been engaged in post trip debriefs on this behaviour. Road Route Analysis: route analysis done on all routes to assess risks along the way and safe stop areas. These are including in pre-trip briefs with drivers. On-road shift change: for many of our 24 hour routes, we have on-road shift changes where drivers are taken to vehicles to ensure that driving hours are not violated. Fleet Operator / Control room awareness of fatigue and management awareness: Fleet operators and control room operators are aware of fatigue dangers and how to deal with and ensure that drivers that phone in when they are feeling fatigued are afforded the correct advice in terms of nearest stop / what to do and the importance of dealing with these occurrences correctly. Are there specific guidelines for operators? No - these are self-regulated. Do you focus on specific times of night that travel might be riskier? Yes - through our DriveSmart programme we monitor High risk driving hours which are the hours from 10 pm to 4 am. For all fleets that do not run 24 hours, we have a no driving standard from 11:00 pm to 4:00 am. Obviously some fleets are even more strict in terms of no after dark driving for our mega loads and fuel and chemical loads. Some are driven by client requirements, but most are driven by our risk assessments of individual contracts. For trips that have to drive through this period due to operational requirements from time to time, operations will put systems in place at the 24-hour control rooms to phone drivers to chat and check on their status. We do have our own in-house clinics, annual medicals and wellness programmes which our drivers are actively encouraged to participate in. What is the importance of technology in combating fatigue among truck drivers? It is important but to date there is no hugely successful system that has worked, or been adopted in the SA Market. There are many tools such as safety belts that measure their heart beat to caps/glasses/dashboard instruments that will measure the drivers eyes and how many times he blinks and pupil movement to alert the driver if he deviates from his norm suggesting fatigue. But these are costly and the effectiveness in the SA market has not yet been proven. Together with the problem of maintaining and using them correctly. We find that no matter how many systems are in place, they are often only as good as the post trip de-briefs and meaningful interaction with drivers are. You can have many tools, but you need to actively manage them and engage with drivers openly and with care to ensure the best results in terms of driving performance, including fatigue awareness. Is technology such as fleet management and telematics tools used to detect driver fatigue and dangerous driving or in crash investigation? Yes, we do as above, DriveSmart DriveCam and Mobile Eye are all directly relating to using telematics to measure and then coach drivers on behaviour and fatigue related patterns of driving and high risk times etc. These are then also used extensively in the post collision / crash investigation. 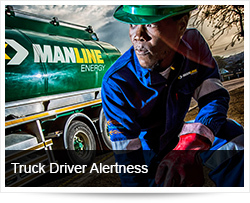 Is in-cab technology available to detect driver tiredness and raise an alarm? Yes. There are a lot of in-cab fatigue related technology. As above. We are currently testing Mobile Eye because it raises the alarm in the cab but also triggers an event which we can manage later with the driver and trend etc. Any aspects not covered by the above questions which might be important to share as important to combat Truck driver fatigue? One of the bigger challenges is ensuring that your driver arrives for work fit to drive and not already fatigued. We can monitor and manage what they do when working for us, however to manage what they do in their own time is more difficult. Does a driver have 4 days off and then drive 12 hours to arrive at work and get onto a company vehicle? Awareness can be created around this by educational material and training interventions together with shift start questionnaires, but they all rely on the driver actively believing in and understanding the importance of being responsible during time off, especially close to return to work, planning leave/off time and ensuring they return to work from long or short breaks fit to work. There are some systems e.g. Pre-shift assessments which can be done, but again this relies on accurate implementation and execution of these, together with good planning to ensure that relief drivers are available if any drivers fail their “fit for work” test. This increases contract costs for operators to have drivers on standby and/or reduced customer service if no standby drivers.